When they had entered the city, they went to the room upstairs where they were staying, Peter, and John, and James, and Andrew, Philip and Thomas, Bartholomew and Matthew, James son of Alphaeus, and Simon the Zealot, and Judas son of James. All these were constantly devoting themselves to prayer, together with certain women, including Mary the mother of Jesus, as well as his brothers. 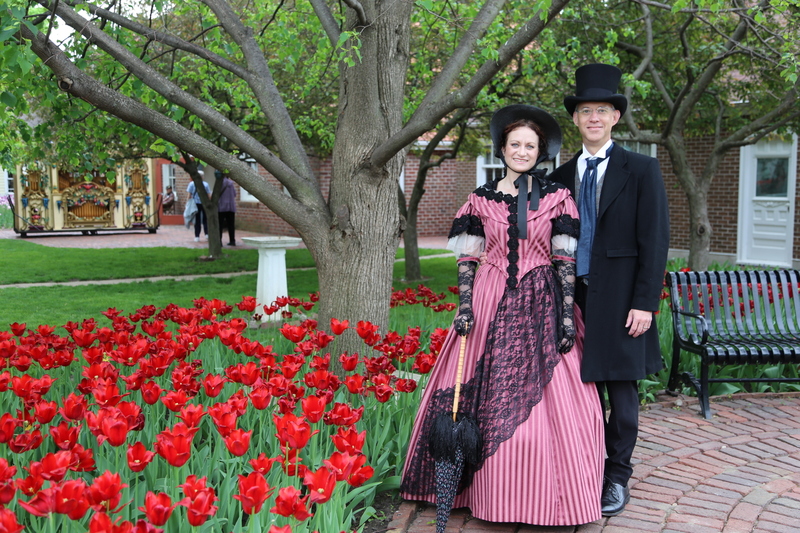 Wendy and I enjoyed our first full day of Tulip Time festivities in our little town, dressed up as the town’s founders, H.P. Scholte and his wife Maria. I was fascinated as we worked the crowd in our 1850s costumes (and had our picture taken 5,872,359 times) the different reactions we received. Residents of the town who know the history would stop us and talk to us about the Scholtes. Some commented what great people the Dominie and Maria were and how much our town owes to them. Some spoke of them as arrogant jerks who imprinted their self-righteousness on our community which continues to plagues us 160 years later. I pondered these things as I walked through the historical village and thought how quickly and radically life changed for the families who left their relatively comfortable, established lives in the Netherlands and journeyed to the barren Iowa prairie to carve out a living from the midwestern soil. There are seasons in life when things change quickly and radically. The tectonic plates of life shift beneath our feet. Life is shaken up, and when things finally settle we discover that our lives will never be the same again. I’ve observed that some embrace the change, follow the flow, and prosper. Some become critical, eschew the changes, and struggle hopelessly against the current. The same events take on competing and opposed perspectives. The followers of Jesus found themselves in similar situation as they huddled in a room behind locked doors in today’s chapter. A week earlier they were riding a wave of popularity as Jesus rode triumphantly into town. Then Jesus was suddenly betrayed, arrested, tried, and executed. Then a few days later He was alive again. But, popular opinion had turned against them. Jesus’ resurrection and the empty tomb sent giant shock waves through the community. The authorities wanted to find them and snuff them out. Jesus had told them to stick together and get ready for even more big changes. Things would never be the same. Even among the crowds of Jesus’ followers who, just a week earlier, were singing His praises, there were those who would shake their heads, eschew the changes, and critically walk away. For the huddled handful who faithfully stuck it out, stuck together, and embraced the sudden changes – they would soon find themselves on the cusp of events that would change them and our world forever. Today, I’m grateful for those who embraced change before us and prepared a way for us beyond what we can really fathom. I pray that as the tectonic plates of life may shift in our own life journeys we can embrace the change, stick it out, stick together and make the way a little easier and more blessed for those who follow in our footsteps. One of the more difficult aspects of going through a divorce is the struggle to know when to speak, and when to be silent, with your children. This is especially true when they are teenagers. Seven years ago, as I walked that painful stretch of my own journey, I found two easy temptations with regard to talking to my girls. First, I discovered the temptation to say too much because the breakdown of the marriage is affecting them so acutely and I wanted desperately want to provide some reason, understanding, and context. Second, I recognized the subtle, self-centered temptation within myself to want the girls to take, or at least to understand, my side of the story. What teenagers, in their stalwart belief that they are both fully mature and completely omniscient, fail to understand is that information without context, knowledge, wisdom, and discernment can become both a burden and a curse. It is said that ignorance is bliss, and sometimes that is true. Sometimes it is the very least appropriate for the situation. As children, we often feel that we have a need to know things. We will even go so far as to think that we have a right to know certain things. We live in a culture steeped in First Amendment rights and the Freedom of Information Act coupled with an almost instantaneous access to any piece of arcane trivial information you could desire. People even publicly post the most mundane and salacious facts about themselves on Facebook and Twitter. Television programming projects an endless hunt for the most juicy, private personal gossip about celebrities 24/7/365. It is no wonder that we feel so entitled to know so much about so many. I found it interesting in today’s chapter that Jesus deflected some of his followers’ questions. Father God knows things we don’t know. He holds certain things close to the vest, and as His children we are all on a need-to-know basis. For some children, this seems terribly unfair, unjust and spurs fits of childish rage and rebellion. Personally, I find comfort in the fact that He’s got it under control and I can trust Him with that. Someday, when I’m ready and it’s appropriate, He’ll perhaps share some things with me. Perhaps by that time it won’t really matter. Until then, I can let it go and experience the freedom that comes from not having to know certain things.